Howdy folks and welcome to week 12 of your CSA. This will be the last week for blueberries, and this variety, “powder blue”, is so sweet, dare I say sweeter than the previous blueberries!? 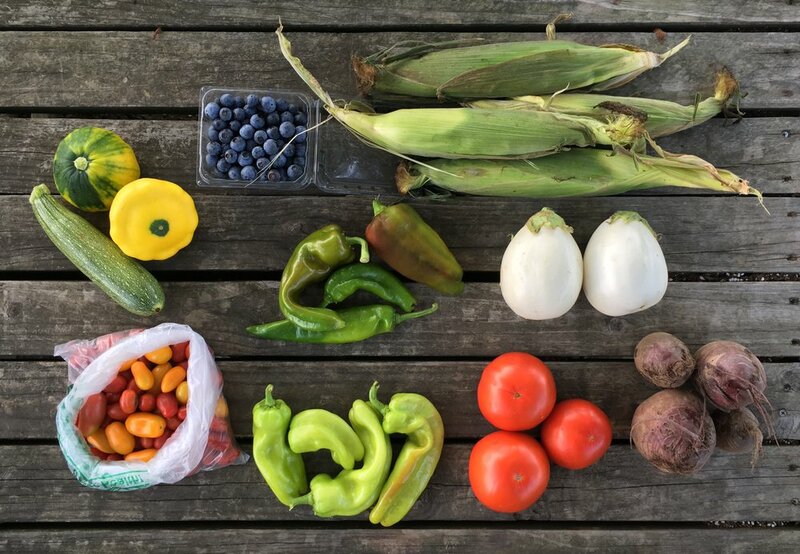 New to this week’s box is corn, cubanelle and anaheim peppers, and beets. Anaheim peppers are famously known for their use in "Chile Rellenos." These have a bit of heat to them and the Cubanelles are a mild pepper. I am going to try to stuff my anaheims this week with diced, roasted eggplant, and cubanelles. Mix everything with quinoa and add some chili powder, cumin, and tomato sauce. Stuff this into my anaheim's and top with goat cheese! I may even do some "mexican" street corn on the side. I roasted some grouper the other night with some cherry tomatoes, and it turned out so good! A nice, juicy tomato with every bite of grouper was perfect! Things at the farm are pretty hot and wet. So hot and wet that it is really starting to take a toll on our tomato plants. Plus, the past few storm fronts we have had has knocked down our plants several times. I’m talking entire rows, completely loaded with fruit, knocked down to the ground. That has been pretty frustrating! Alrighty, we hope you've been enjoying the bounty so far. If you're having trouble getting through all the veggies don't forget to whip up our favorite "compost pasta" recipe. Which is basically a huge pot of sautéed veggies (throw all of them into the pot) with plenty of butter and garlic and stir into hot pasta with some parmesan cheese. It's a bullet proof method for making room in your fridge for the next round of vegetables. As always, we're so thankful to have you all be a part of our farm family. Thanks for taking the risk to join a CSA and for riding this crazy wave with us. Y'all are awesome. Cheers!